The wholesale supply of industrial components distribution includes individual parts used in plant machinery such as fixings, replacement machinery parts, tools and consumables. It also includes the supply of the raw materials used in production. The industry currently finds itself at a tipping point: growth in industrial components distribution has stagnated, but the move towards deregulation following the US election has shown that there is strong potential for growth. One prevailing trend in the industry is towards globalization. As distributors become established, they tend to outgrow their domestic market and reach out towards global opportunities. However, while smaller organizations may source stock globally, they tend to keep to their domestic markets when distributing their goods. A large part of the change in the industry is driven by new technology facilitating e-commerce and allowing businesses to trade globally with ease. Previously, certain technologies have been out of reach for SMBs. With the largest industrial components distribution companies taking up a large percentage of market share, it’s very difficult for SMBs to compete and grow. Smaller businesses have been unable to access the technology to compete on an even footing. This lack of growth and the reduced access to capital then continues to prevent them from accessing technology. Traditionally, SMBs have responded to the threat posed by globalized businesses by building strong relationships with existing clients. But customer loyalty is in decline, and it is increasingly common for end suppliers to change their distributor. This is exacerbated by the reluctance of small suppliers to embrace e-commerce; while technology is now available to fit SMB’s budgets, there is a culture of eschewing the available software in favor of traditional methods of acquiring new business. With the industry facing a watershed, SMBs could well be the catalyst that drives industry change, provided they are willing to remain relevant by accessing new technology. For smaller operations, attempting to compete with larger players in a global market is difficult, but SMBs have an innate advantage in their size: they can specialize in niche industries by becoming experts in specialist industry verticals. This gives them an advantage over larger businesses that trade in a number of horizontal markets. Their expertise is something that larger businesses can’t acquire easily, and by exercising control over this knowledge, they reduce their vulnerability to acquisition. By this method, they will be able to grow in their domestic market by trading in specific industry verticals and building a strong brand identity. New technologies such as warehouse optimization software can enable SMBs to free up working capital. Much of this technology is available as an add-on for existing Enterprise Resource Planning (ERP) systems, and new technologies are now available as Software-as-a-Service (SaaS), meaning that implementation and maintenance are cheaper than ever. By optimizing stock control, working capital can then be directed towards developing an online presence and increasing the efficiency of operations through new warehousing systems. This means that SMBs can turn their weaknesses into strengths. Embracing new technology can help them to mimic the economies of scale of larger operations to increase efficiency and access new markets. It also enables them to use their size to offer a personal service to clients and build brand loyalty. Looking to compete more effectively? 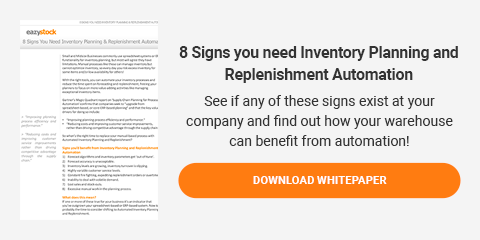 Discover the benefits of optimizing your wholesale business with our white paper 8 Signs you need an Inventory Optimization Solution. Find out what warning signs you should look for within your company and how your warehouse can benefit!